A work-in-progress day for the project was curated by Gwen Dupré at Govan Project Space on 18 August 2018, showing work from Gwen and her collaborator, Bristol-based musician Jamie Maule. It comprised an exhibition of material from and responding to the Free State and GalGael, and a programme of events including a reading group discussing texts that informed research, and a creative group workshop using a sound collage by Jamie to think about ideas of connection to place, delivered by Catherine Lacey and Gina Dupré. 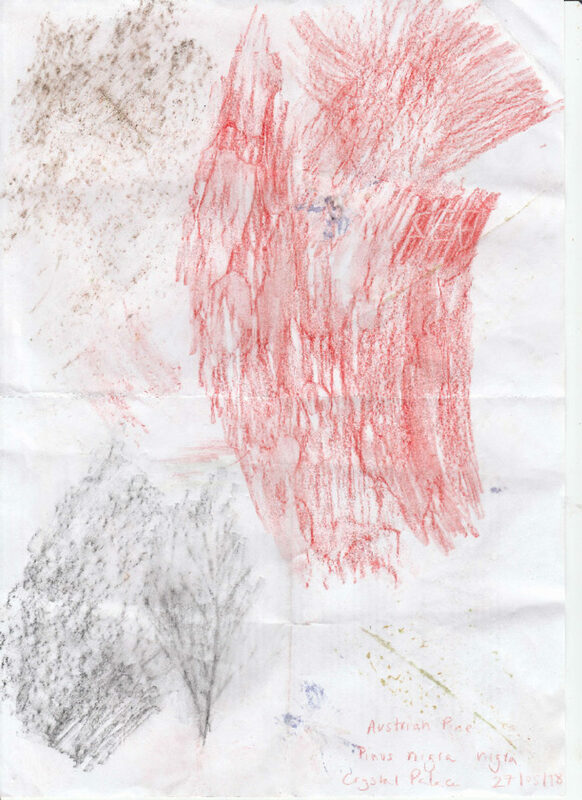 The following essay was written by Olivia Scott-Berry after correspondence with Gwen about Pollok Free State, and a trip to Crystal Palace Park where tree rubbings were made by Olivia and Jim Scott-Berry. Fears about the posthuman—what comes after us, how we have shaped it—often take the form of/are prompted by the prehistoric, with its intimations of a pre-human deep time almost beyond comprehension. Post-apocalyptic fiction is often so effective at exploring these realities because it takes as its premise social and natural orders that have already been interrupted, allowing for the speculative development of new approaches using non-conformist models and analogue technologies to form and record a new community. 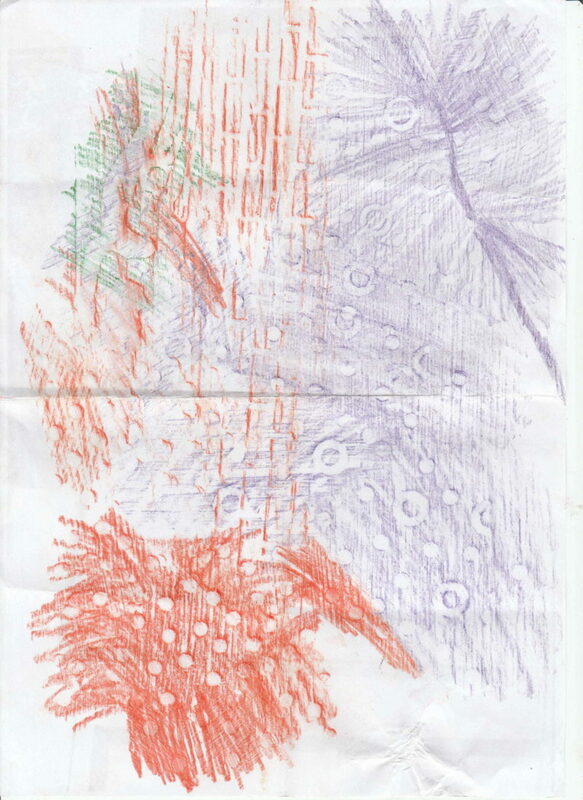 Such instances cut across accepted sequences to suggest that not only were they always incomplete and incorrect—as in the case of the Crystal Palace dinosaurs—but that different kinds of pattern altogether have always been in operation. 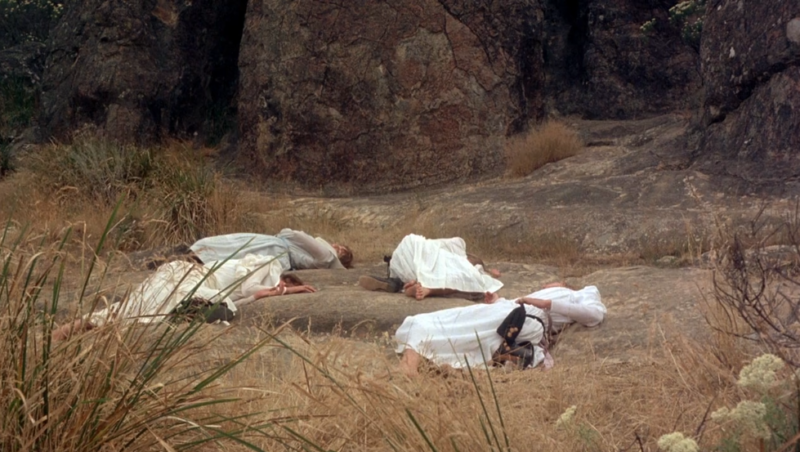 Picnic at Hanging Rock, 1975. Such instances often seem hysterical—breaking with accepted modes of expression, and as such incomprehensible, frightening—because they fracture our usual experience of time, self, being. Their mode is often the surreal, paranoiac: the amateur detective following a trail of zig-zagging string across a collaged board. Their lines spiral out, becoming the labyrinth it is supposed to be guiding them through, their trail bread crumbs that blow away with the wind—unreliable glints in the soil. And yet it all leads … somewhere. To another kind of knowledge apparent in these patterns and their very disruption—of the way time and the earth’s forces really seem to work, once they are approached in this more diffident manner, with a willingness to learn. All italic quotations are taken from ‘Given to the People’, 2008, a film about Pollok Free State by Simon Yuill. Of the park’s three eventual mascots, the ichthyosaurs presumed to be like crocodiles, basking on land, have since been shown to be more like sharks; the nose horn of the iguanodon is actually its thumb bone, and the megalosaurus taken to be quadrupedal is now believed to have been bipedal. ‘Marion was the first to break through the web of silence. “Those peaks … they must be a million years old.” “A million. Oh, how horrible!” Edith exclaimed. “Miranda! Did you hear that?” At fourteen, millions of years can be almost indecent. Miranda, illumined by a calm wordless joy, merely smiled back. Edith persisted. “Miranda! It’s not true, is it?”[…] “Stop it! You’re making me feel giddy.” ‘- Joan Lindsay, Picnic at Hanging Rock (Vintage, 2013 ), p.26. ‘Colin Macleod came from a family with Hebridean roots and grew up in Pollok in the south side of Glasgow. After jobs with the Forestry Comission and periods of employment- when he would look for bits of scrap wood and taught himself to care—he travelled as a volunteer for the environmental charity the Scottish Tree Trust to South Dakota. Here he witnessed the indigenous people’s struggle to reclaim native language and traditions, quickly seeing parallels with his homeland.’- ‘Inspirational son begins his long voyage home’,The Herald, 6 November 2005. ‘[Colin visited] the Rosebud Reservation of the Lakota and specifically their Sinte Gleska University. On a later trip to Canada he was inspired to start carving particularly by the Abenaki peoples’- Gehan Macleod, from email correspondence between Gehan Macleod and Gwen Dupré, 2018. ‘For a genealogist, a gravestone rubbing may become a permanent record of death when a gravestone is rapidly deteriorating. […] The stone’s condition, art, and inscription can tell what was going on in an area at a specific time. Studying multiple gravestones in one specific area can give even more information about history.’- ‘Stone Rubbing’, Wikipedia. Olivia Scott-Berry is a writer from London. She studied English Literature at Cambridge, where she began experimenting with various forms to develop a collagic approach with which to explore her interests in gender and ecology. Her poetry has appeared in student publications Notes and The Dial, as well as various zines, including Pilot Press’s A Queer Anthology of Rage, and she is currently working on her first long piece of prose.